HRH The Duchess of Gloucester presented volunteers of Chester Adult Phab Club with a commemorative crystal and a signed certificate from Her Majesty The Queen at an award ceremony held at the Town Hall Chester on Tuesday 16 October 2012. The ceremony was also attended by David Briggs (Lord Lieutenant of Cheshire), The Lord Mayor of Chester, Councillor Pam Booher and Lady Mayoress of Chester, Julie Knight. a proud moment! This award is made annually recognising and rewarding excellence in voluntary activities carried out by groups in the community. Our club were nominated by DIAL West Cheshire, www.dialhousechester.org.uk and Chester Voluntary Action (CVA), www.chesterva.org.uk. We thank them for their support. Her Majesty The Queen announced the Award in 2002 to mark the occasion of her Golden Jubilee. The Award is given every year to groups of two or more people in the United Kingdom, Channel Islands and Isle of Man who volunteer their own time to enhance and improve the quality of life and opportunity for individuals or other groups in the community. 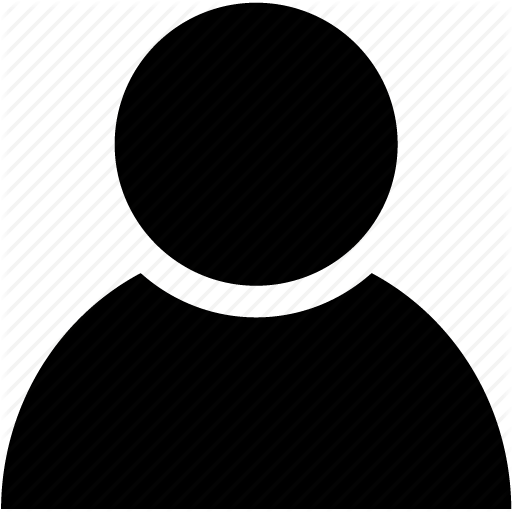 The award is the highest honour given to voluntary groups and is the equivalent in status to an MBE. The club is particularly delighted to gain this award during Her Majesty The Queens Diamond Jubilee Celebrations 2012. Chester Adult Phab Club received a certificate signed by Her Majesty The Queen and an exclusive commemorative crystal presented by HRH The Duchess of Gloucester at an award ceremony at the Town Hall Chester on Tuesday 16 October 2012. Lord Lieutenant of Cheshire, David Briggs was also in attendance and The Lord Mayor of Chester, Councillor Pam Booher and Lady Mayoress of Chester, Julie Knight. “It was an amazing experience, I will never forget” she also went on to say “Members of the Royal Family were so friendly”. Our members were one of 8,000 people who attended the Garden Party. It was also the first garden party for the Duchess of Cambridge (Kate Middleton). 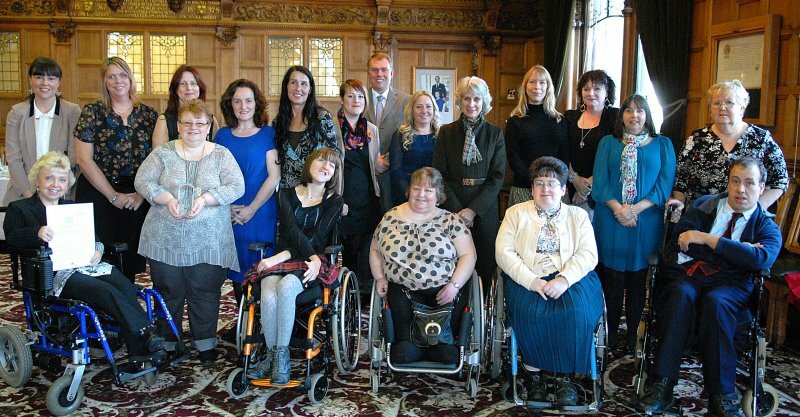 In December 2011, three members of Chester Adult Phab, Kate, Lynda and Clare were interviewed by County Lord Lieutenants and their representatives. After three more stages a recommended list of volunteer groups are sent to the Queen for her approval. 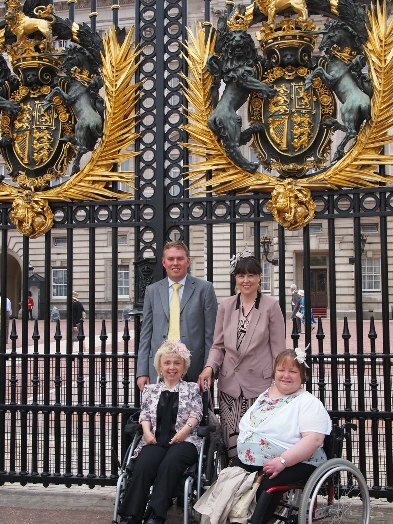 Members of Chester Adult Phab who attended the Garden Party at the Palace. 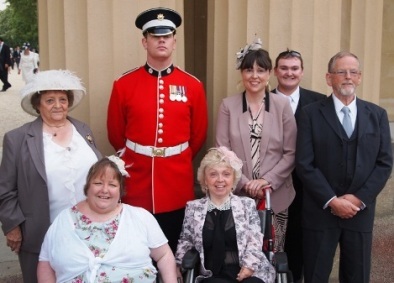 Tuesday 29 May 2012 (top row left to right Andrew and Kate), (Front row bottom left to right Lynda, BEM (Chair) and Clare) outside Buckingham Palace gates. We are proud to announce Chester Phab were successful. 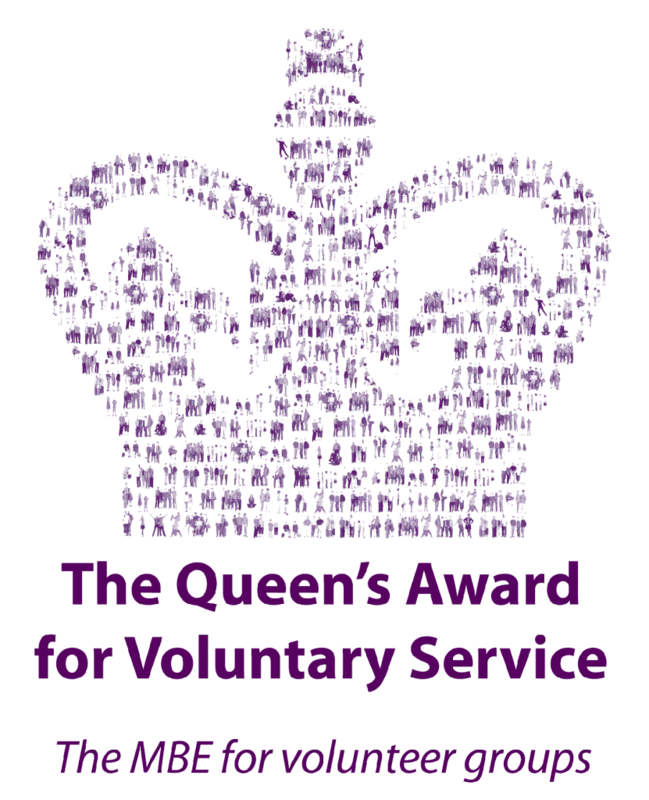 The Queen’s Award for Voluntary Service during 2012. Chester Adult Phab was founded in the late 1980’s by Lynda who is still very much at the reins of the organisation today. “I have made lifelong friends”.